I had considered returning to Newark for clear weather photography and hitchhiking a plane ride over the earthworks. After three weeks of shoulder pain and repeatedly awakening every night as a result, I've decided to trim back those plans. I have completed the GPS readings I wanted in the Newark area. I will have to forward my general delivery mail. I also decided to visit fewer sites in Indiana along the return. I did visit the two important Hopewell sites yesterday, Winchester and Anderson, before driving here after dark. 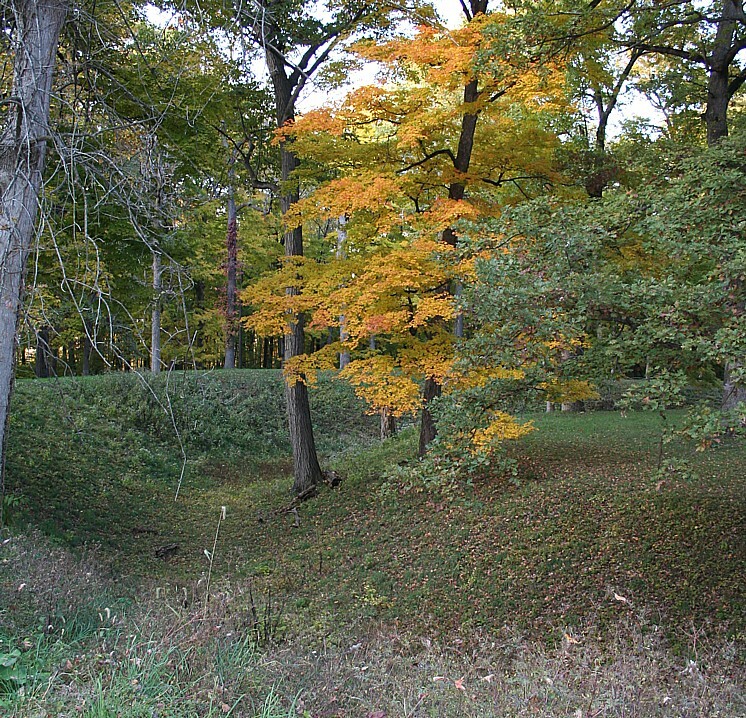 Squier and Davis surveyed and drew the Winchester enclosure, a 1320' by 1080' embankment enclosure with only two openings, one near the center of the east and west ends. Additionally, a rectangular entry projected from the west opening. The 8' high elliptical mound situated near the center of the enclosure is no longer readily visible in what is today a cornfield. The embankments were difficult to detect, but are obvious after careful study of the landscape and local inquiries. Jean Fisher owns part of the work, pictured below. She kindly allowed me to wander her property and take GPS readings. Note the slight rise in the lawn. The disturbed area is a recent excavation. Just beyond the fence, the embankment turns west, and the slight rise is again easily detected along the brush line. I found sufficient sections to place the work accurately. Two other area earthworks shown by Squier and Davis in the area map, Ring Spring and Little Fort, escaped my detection. 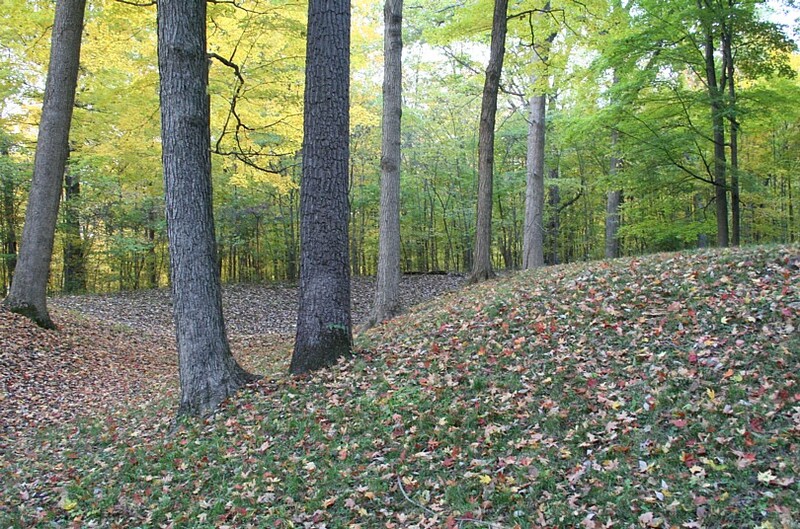 Mounds State Park contains some of the best preserved earthworks in Indiana. A total of ten features are known on the grounds, including several very impressive and unique earthworks. 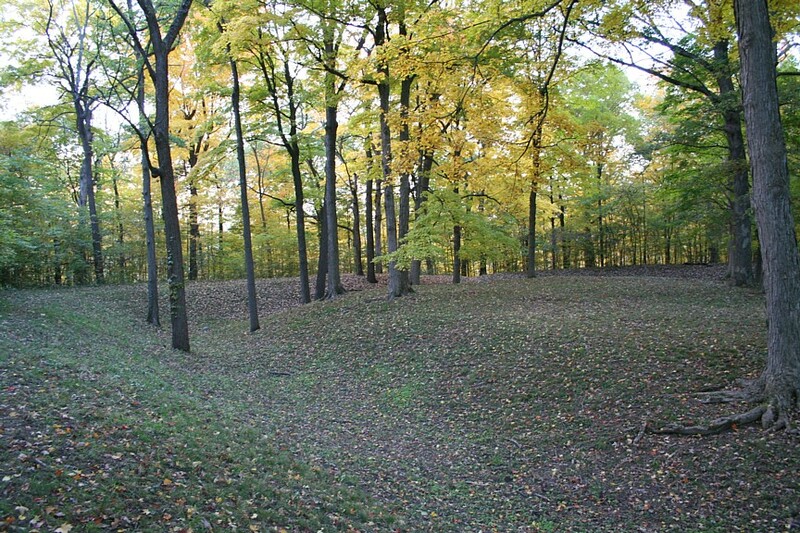 Great Mound, the largest of these, has a circular, 140' in diameter, central platform surrounded by a 10' deep by 60' wide moat, then by a 9' high by 60' wide at the base embankment. The outer circumference is about 1200 feet. A causeway opening leads to the platform. The view above looks out the causeway from the central platform. The view below looks towards the causeway opening in the embankment. Fiddle Back Mound is immediately adjacent to Great Mound. 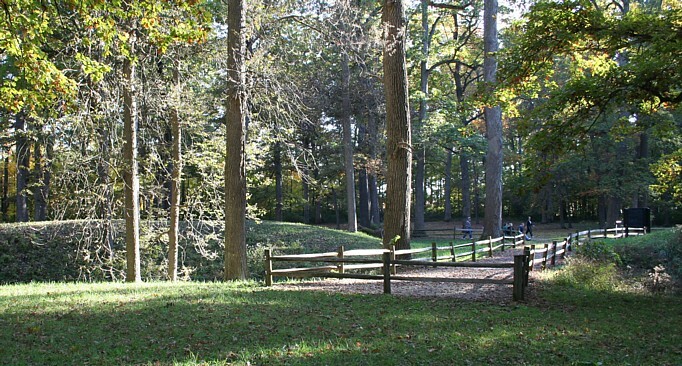 In the view below, the fence in the foreground surrounds the Great Mound embankment. The bank of the White River is in the woods just beyond Fiddle Back Mound. Upstream, the Winchester enclosure is also near the White River. Why this rectangular platform, surrounding moat and embankment are called 'Circle' Mound, I do not know. I'm impressed that the following images, taken in near darkness without a tripod, are even useful. I braced the camera against the trees. With a film camera, I would not have wasted film. 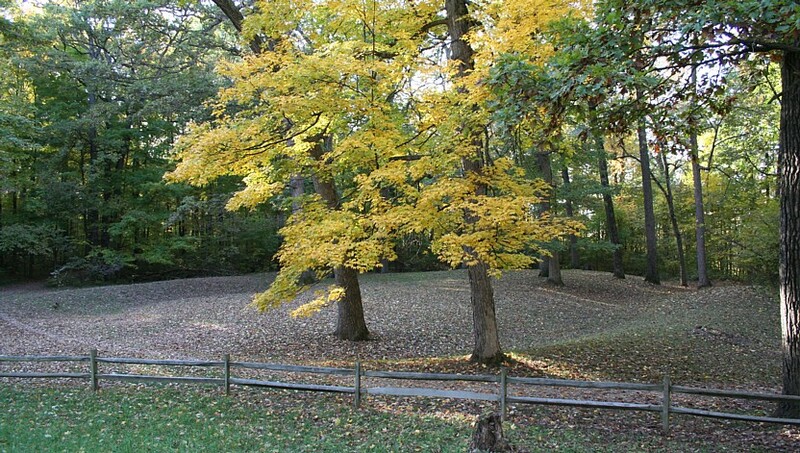 Like Great Mound, Circle Mound has a causeway to the central platform. Both features have a sufficient moat to determine level using water. 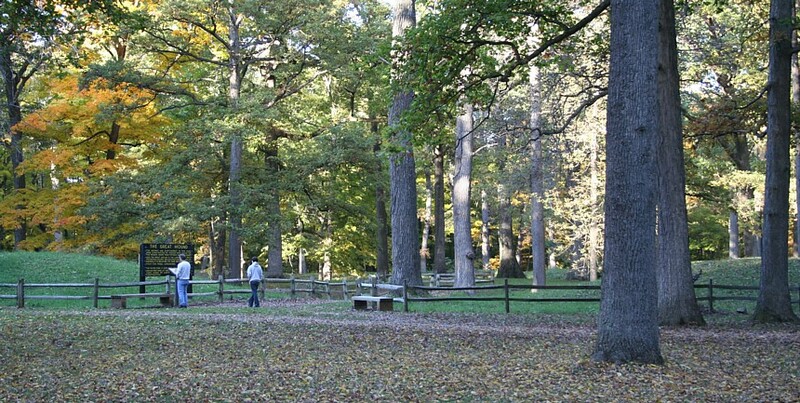 The park brochure states, "Research indicates these mounds were used to keep track of the seasons, the positions of over 100 of the brighter stars, as well as the moon and visible planets." After the last photograph, I hiked back to the van for a flashlight. The Circle Mound readings were all taken in darkness. With so many beautiful trees, the GPS readings had taken far longer than I expected. One of the sites that I decided to skip in Indiana is the Mann site. 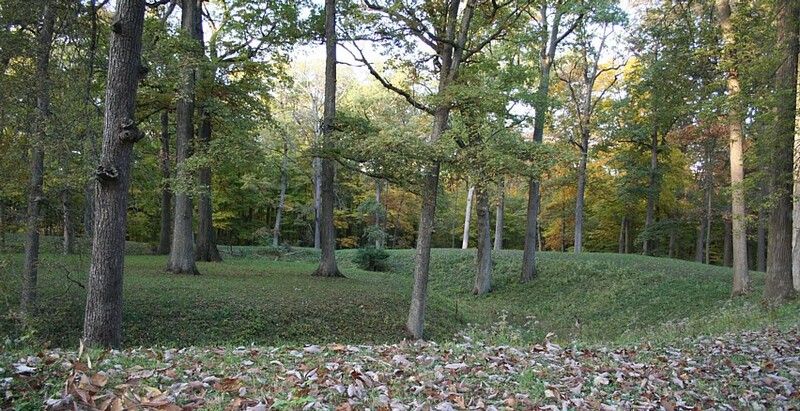 GE mound, a loaf-shaped mound 410' by 164' by 20' high, is truly monumental in scale and ranks among the very largest of Hopewell mounds. Also known as the Mt. Vernon site, the mound is located near Mt. Vernon. Please send me the GPS data if you have it. 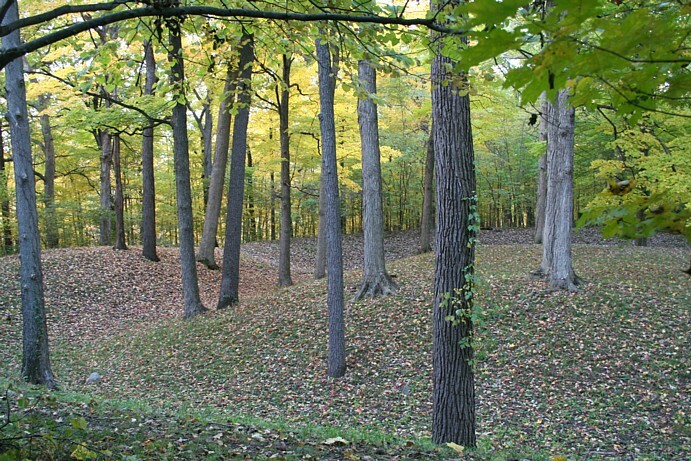 Another major site in Indiana, albeit later than the Hopewell in cultural sequence, is Angel Mounds, one of the best preserved prehistoric Native American sites in the United States. More later, after visiting Cahokia.